If you visit iPad Kids regularly, you probably already know that we strive to stay on top of the new, different and fun things that come out of the children’s app industry. So naturally, when I come across something that has not been done before, I get super excited to tell you all about it! We’ve all seen art oriented coloring apps,and we all know how much kids LOVE to draw. We’ve seen iPad easels and crayon stylus‘ and everything in between. But what if the pictures that your child draws on real, physical paper, could come to life on the iPad screen? Amazingly enough, a new app released on May 1st called ‘SquiggleFish’ makes that happen! I have not seen anything like this before, and neither had my kids. Needless to say, we have a new favorite app! To make your drawings come to life using SquiggleFish, all you need is a black felt pen, some paper, a few crayons, and your iPad with SquiggleFish downloaded! First, use the black felt pen (we used a non-toxic, black, Crayola marker with a wide tip and it worked great!) 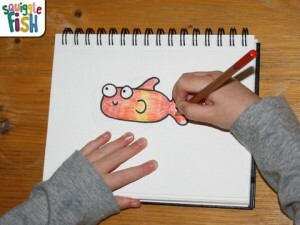 to draw the outline of a fish. The fish can be realistic or otherwise, whatever your child’s imagination decides! Then, color in the black outline with whatever colors your child chooses. Once kids are happy with their fishy art, use the app and scan the fish with the iPad. The fish will appear in an underwater habitat on-screen and begin swimming around! How awesome is that?! This is all made possible, of course, by the iPad’s camera technology, so it goes without saying that this app will only work with iPad 2 or iPad Mini. 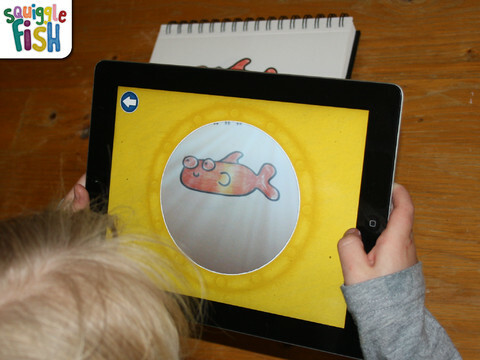 While the app is very easy to use, adult help may be required to scan the fish as the iPad has to be held extremely still for the camera to be able to pick it up. To give this hot new app a try, click the Apple iTunes App Store button below!